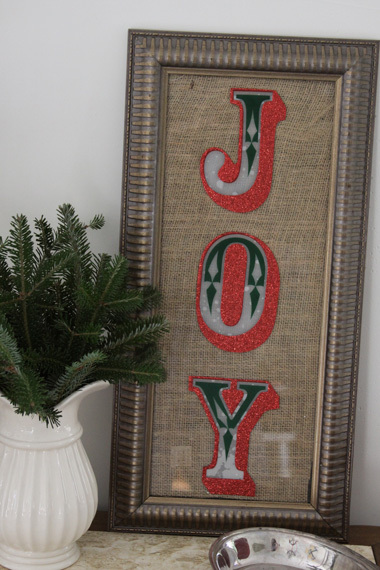 Here is a quick trick I use around the holidays to transform framed pictures into temporary holiday decorations. Making those framed pictures fit in with your holiday decor is super simple, and it takes just minutes to transform them to fit the season. 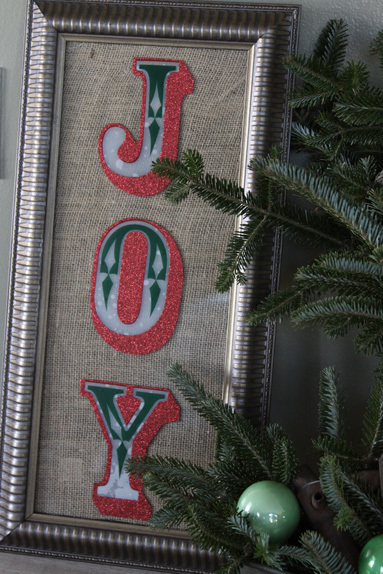 Pieces of fabric inserted into a frame can be as simple or festive as you like and make a big impact without a lot of money or time. 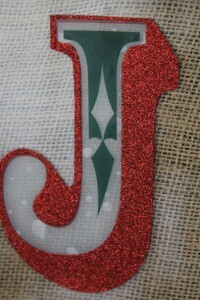 You can then add window clings, or wall decals to make your frame sparkle and shine with Christmas flare without damaging the glass. It is a totally temporary solution for the holidays, super inexpensive, and easy too! So that is really all there is to it! If you have a framed picture that is sticking out like a soar thumb now that you holiday decorations are up – this is a great solution. Open your frame and use the glass to trace the size you need on a piece of fabric. 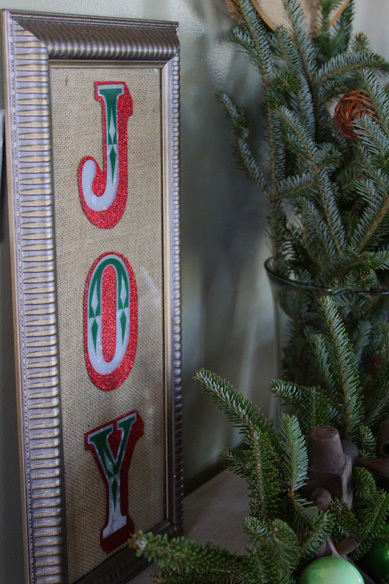 I used burlap because… well I love it, and I always have scraps and remnants to use up. It worked great in our home, and is fitting with our other holiday decorations. Choose whatever you like. 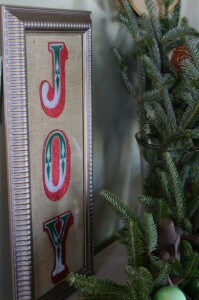 make it festive and fun, or as simple and plain as a piece of burlap. Cut out the fabric piece you traced, and insert it into your frame. Now put frame back together with your picture covered by fabric. Now add some window clings or wall stickers – something to jazz up your framed fabric if you like, or just leave it with the fabric if it is festive enough all by itself. I showed you a DIY burlap sign that I made for our living room earlier this week, and I created this at the same time. As I mentioned in that post: When I hauled the Christmas stuff out for the year I found some cool wall decals that I had bought after the holidays last year at one of those 90% off clearance sales. The decals were pretty large, and had a great font, and the best part is that it cost me less than $1.00. So the “Joy” sticker is one of the decals that I scored for next to nothing… and this is how I choose to use it this year. It looks great propped up on a table, or hung on the wall. 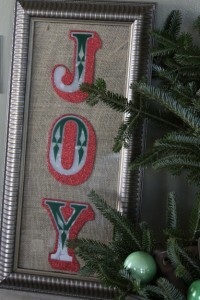 It really transformed a simple frame that we had into a special piece of holiday decor. The best part is it didn’t cost a thing to switch things out and make it fit the season (other than the buck I spent last winter on the decal.) For me it is all about using what I have, and making something pretty for our home that I love. Here is another little trick that I love to use around the holidays. After we get our Christmas tree there are always branches that get cut off of the bottom. I always keep them, and use them to decorate throughout the house. 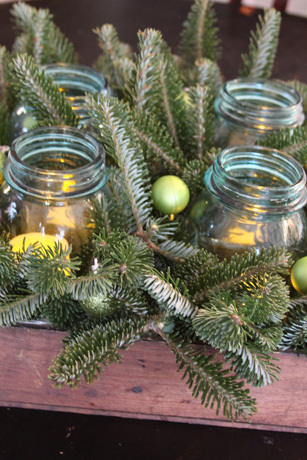 I stick them in vases, bottles, mason, jars, and jugs (like in the picture above) with a little water. Then I place them throughout the house for the month. I put some on the bathroom counters, sofa tables, dinning room table, and entry tables. This centerpiece sits on the dining room table and was made using little branches stuck into wet floral foam in an old wooden box. I added mason jars with flame less candles (because little hands may touch it) and some Christmas ornaments to add a little sparkle. All things I already had at home. 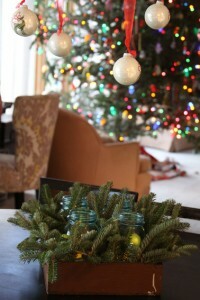 They add a great natural decoration and I love using something that I would have thrown out otherwise. It is an added bonus that the make every room that I put them in smell great all season long!